It was the late Afrobeat king, Fela Anikulapo Kuti, who sang in one of his chart busters, “Teacher, no teach me nonsense.” But some teachers in a private school in Calabar are teaching their pupils nonsense. One of the them, on Wednesday, committed a cardinal error. “Children, the capital of Imo State is Warri. Repeat after me: the capital of Imo State is Warri,” she said with utmost confidence, while the pupils chorused along with her, innocently. The teacher is in the employ of a private school, Aunty Mfon Obong Nursery and Primary School, on 15, Howel Street, Off Mayne Avenue, Calabar. Our correspondent, who was passing in front of the school when the teacher committed this blunder, observed that a lot more factual errors came up while teaching the pupils whose ages ranged from four to seven years. During an interaction with the three teachers in the school, one of them with the name, Goodluck, said the proprietress believed more in their ability to work than in their qualifications. She also said she was not aware whether or not the school was registered or not. nursery session, while a senior secondary school certificate examination holder handles the primary school. Besides, the school does not operate in a conducive environment. 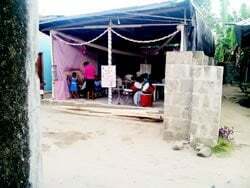 While a part of it operates in the corridor of a room and parlour, another part operates inside a plank building which houses The True Land of Miracle Church. Many of such schools dot different parts of the state capital and neighbouring towns. No fewer than 35 of them have been shut down by the state Ministry of Education recently. There are over 650 registered private nursery, primary and secondary schools in the state, with 1, 018 public primary schools and 260 secondary schools. Worried by the development, the state Commissioner for Education, Prof. Offiong Offiong, said the government would continue to clamp down on such illegal schools. He said it was obvious that the centre was never registered, adding that the ministry would immediately shut it down and prosecute its owner. “There is no way that kind of school can be approved. This bothers on criminality. If you gather people’s children and exploit parents just because you want to survive, then you are a criminal,” Offiong said. He expressed worry that the foundation of the pupils who attend such illegal schools would be faulty since they were being taught under miserable conditions by unqualified teachers. The commissioner also confirmed that over 35 of such institutions were recently shut down in Calabar and neighbouring towns, adding many of the new ones in different places were probably being run by the same people. He noted that once a school was registered by the government, the educational content of what the teachers communicate to the pupils was constantly monitored in order to ensure compliance with standard practice. Offiong explained that many of the public primary and secondary schools hardly fill their registration quota for pupils, wondering why parents would choose to take their children to mushroom schools when there are standard public schools with qualified teachers.